Hello everyone! Jerm here with some more World Cup Bid related news for you guys! 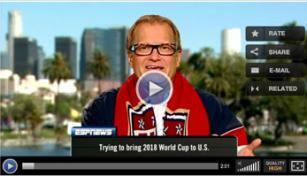 Drew Carey, host of the Price is Right, and formerly the Drew Carey show sat down with ESPN recently to go over the Bid we officially presented to FIFA today. Now I know you may be wondering what Drew Carey&apos;s involvement is, but let me say that Drew Carey is one of the biggest supporters of this bid, in addition to being a huge soccer fan in general. Drew is a minority owner of the Seattle Sounders, a second year MLS franchise and just a very enthusiastic soccer fan. Drew also sits on the USA Bid Committee Board of Directors. Check out the video below and let us know what you think, and if you think we should get the World Cup in 2018, or 2022. That&apos;s all for now, but thanks and stay tuned in for more updates on soccer related things to do in Tampa Bay!